Paithani Saris not only give an elegant look but also adds royalty and thus most of the brides to be like to wear these heavily embellished Paithani sarees on that auspicious day. Paithani Saris teamed up with the appropriate accessories, adds enormous grace and beauty. Paithani sari is known for its intricate weave of pure silk and gold. The Paithani sari has played a significant role in weaving together the cultural fabric of Maharashtra. Paithani sari named after the Paithan region in Maharashtra state where they are woven by handmade from very fine silk, it is considered as one of the richest saris in Maharashtra. The Paithani sari is known the world over for its uniqueness. It is one of the most beautiful saris in the world. It’s beautifully crafted, with an exquisite zari border. The process of preparation of a Paithani sari can take a time period ranging from a month to years. It is because of these reasons that this sari is rather expensive. Paithani saris evolved from a cotton base to a silk base. Silk was used in designs and in the borders, whereas cotton was used in the body of the fabric. The Paithani silk saris are one of the richest gold brocade saris with stunning gold patterns woven in them. The zari used in the preparation of the sari is specially procured from Surat in Gujarat. It has an ornamental zari border and pallav, and buttis (little designs) of tara (star), mor (peacock), popat (parrot), kuyri (mango), rui phool (flower), paisa (coin) and so on. 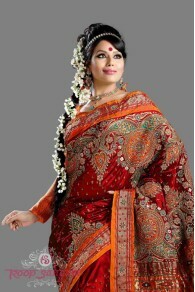 Paithani sari is characterized by borders of an oblique square design and a pallu with a peacock design. Among other varieties, single colored and kaleidoscope-colored designs are also popular. The kaleidoscopic effect is achieved by using one color for weaving lengthwise and another for weaving widthwise. Paithani saris are woven in a number of colors. The colors that are typically used in these saris are kaali chandrakala (black), uddani (lighter black), pophali (yellow), neeligungi (blue), pasila (a combination of green, red and pink), pheroze (a blend of green, white and red), samprus (a mixture of green and red) and kusumbi (a purple and red combination). The very delicate colors of the Paithani silk saris give it a unique touch. Good to know that you like what we post. Do keep commenting and giving your suggestions on post me make here..